I’m catching up on my backlog of unsorted elements that have been building up over the past few years, and wrote an article about the process. Check out Sorting Time to read about it. 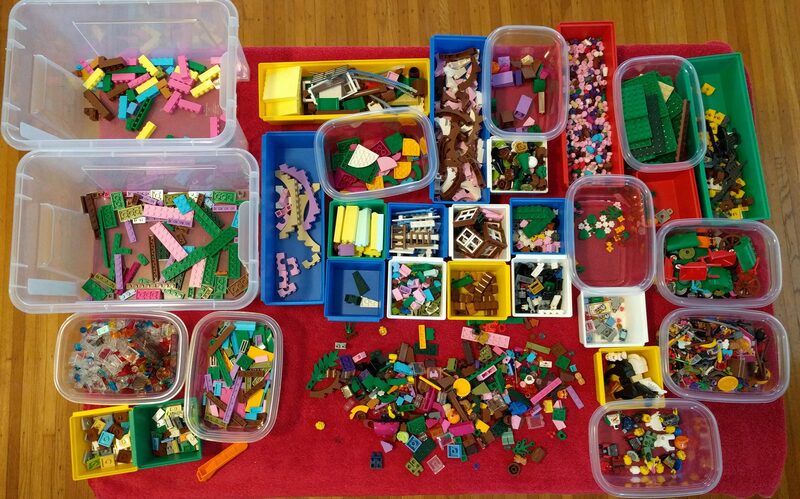 First-stage sort of all the parts from all 14 of the Friends sets. In January I did a review of each of the sets in 14 days called “Fortnight of Friends” and these are the parts after dissassembling all the sets. This first pass uses a bunch of my sorting bins to divide the parts into the following major categories. Each one will require its own second-stage sort (and perhaps in some cases, a third) before the parts reach their final resting place. These categories are totally arbitrary and seat-of-the-pants, and though they do roughly correlate to how I store the parts, really anything that reduces entropy is helpful. Now that I’ve finished the initial sort, I need to process these further. I’m having trouble deciding how to integrate these into my collection. 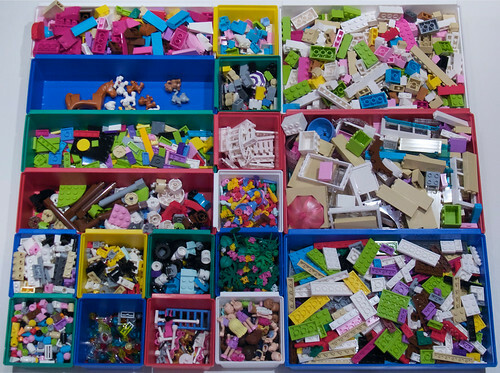 For bricks, plates, and tiles, I sort by color and then within the bin for each color I have Ziploc bags for each size, so I can put the new colors into their own little mini-categories, probably just one bag for each color… But for the other parts, I generally sort by type, and I’m worried the exotic rare colors will get lost among the ordinary ones… so should I mix them with the other colors and maybe never see them again? Or should I put all the purple pieces together regardless of shape? This is a problem I’ve been facing for some time and I keep going back and forth on how to deal with it. Any new ideas out there? I won’t give it away for free. Sorry if that’s disappointing, but although I am a big fan of open source software, the reason that works well is because the users can contribute back to the development of the software by adding features and fixing bugs, and submitting patches to the author. LEGO creations are fundamentally different from that, in that once I’ve created a design I’m really not interested in collaborating with other builders to change it. I might take some feedback and revise it based on that, but I’m not going to accept patches for my models. So the open source model doesn’t really suit my LEGO creations. Similarly I am a fan of Creative Commons, but again the main benefit of that is the ability for people to incorporate my work (such as my photos, which are licensed with Creative Commons) into other works without having to jump through a lot of hoops to get approval. Some of my photos have been used by Web sites and even mainstream news sources because of this. But I don’t think that would translate into LEGO model designs. I won’t use LEGO Digital Designer (LDD) because you give up too many of your rights when uploading the designs to LEGO’s site. It would be convenient to use Design By Me to create kits from my models, but then it would be LEGO profiting from it instead of me. Is that too selfish? I think if I’m going to go through the effort of creating instructions for a model, as opposed to just photographing it or even creating an LDraw file of it, I’d like to receive something for my efforts. (LDraw is the easy part, it’s making the instructions that’s harder – even though LPub does a lot of the work, there’s still a great deal of manual adjustment of the layout to get it to where I want it). Selling kits of my models is something I’ve thought about a lot, and I may do it for one or two models, but the problem is obtaining the parts. It’s rare to find one BrickLink store that has all the parts for a model, so I’d have to order them from several stores – or deplete the parts in my collection, which again means going to BrickLink to replace them. What I know I can do is sell PDF or printed copies of the instructions. To that end, I’m planning on setting up a store on Etsy.com and listing the instructions there in both ebook and printed format, and some kits for small and popular models I’ve designed. So, watch this space for an announcement when I get my Etsy store up, and in the meantime let me know if there are any particular models of mine you’d like to get the instructions for. Prices for smaller models will be around $20. I’m not generally interested in doing custom work, but if the idea grabs my interest I may do it. But in general I would refer you to someone who does that for a living. There’s something new for LEGO Technic fans from No Starch Press. These books from Yoshihito Isogawa are a great guide to all the wonderful ways you can combine LEGO Technic gears and related elements. I’ve always been a little wary of Technic myself. Even though I got an Expert Builder parts pack as a kid, I never did a lot with it. (I was probably too young, since I was only 6 when that set came out in 1977.) I’ve built a number of modern Technic sets, most recently the Lego Technic Crane Truck 8258 , but I’ve only done minimal work with designing my own Technic machinery. Mostly what I’ve done is simple gearing such as my Scrambler amusement park ride, but I always seem to have trouble getting the gears to do quite what I want without either destroying the gears, skipping teeth, or woefully misjudging speed and/or torque. 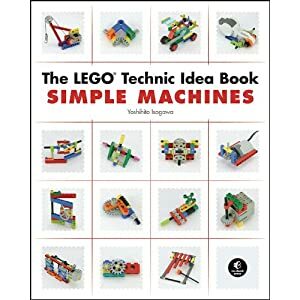 The first book is The LEGO Technic Idea Book: Simple Machines which shows a myriad of different ways to combine LEGO gears and pulleys to achieve particular gear ratios and directions. If you’ve ever scratched your head wondering how to get a certain speed or torque out of a LEGO motor, your answer is in here. Even the most experienced builders will certainly find something new they can use. For example maybe you know how to get the gear ratio you want, but the mechanism you’re thinking of is too bulky to fit into the model you’re working on. Take a look through this book and there’s a good chance you’ll find a better way to get the same effect in the space that you need to fit it into. The LEGO Technic Idea Book: Fantastic Contraptions is full of clever ways to combine gears, pulleys, springs, and magnets to create models that move. There are ideas for shooting projectiles, building shock absorbers, and even using magnets to animage LEGO minifig scenes. The only problem is that the magnets shown have been discontinued (due to fears that a child might swallow magnets which would get stuck in their digestive tract and require surgery – for example, the new train sets have a redesigned coupler with a magnet permanently affixed), so that might be frustrating to some people without extensive collections of older parts. 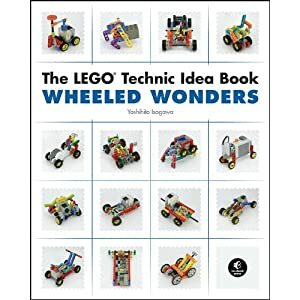 Finally, the The LEGO Technic Idea Book: Wheeled Wonders is full of great ideas for LEGO vehicles. Drivetrains, steering mechanisms, and other vehicular ideas are illustrated in full detail. The examples in these books are purely pictures. There are no verbal explanations, which you would think would be a problem. But the pictures are reduced to such a level of simplicity that it’s easy to understand the mechanism without any text, and if you build them you could easily understand how they work. There are a lot of tips that show ways of combining gears that I had never thought of, and as I was flipping through it I kept thinking “Oh, that would be good for X” type thoughts. The lack of text would also be helpful for younger kids or people whose primary language is not English (or Japanese, in this case). I think the one area where this could have been improved would be to show more complex ideas – instead of just showing the simple combinations of parts to achieve a particular kind of connection, show ways to combine these together to create more intricate machines. Some of the examples in the Fantastic Contraptions and Wheeled Wonders books do this to some extent, but I’d prefer to see that taken to a higher level. Also, instead of just showing each model from a variety of angles, I’d like to see step-by-step building instructions or to see some of the simpler modules combined together to create more detailed ones. One area that isn’t explored very well is motorizing the sets. There are some examples that use motors, but they are largely built using the older 9V motors instead of the current Power Functions parts, and with the Power Functions remote control system, there are a lot of things you could do that aren’t covered by these examples. Hopefully they will come out with a fourth book featuring Power Functions. 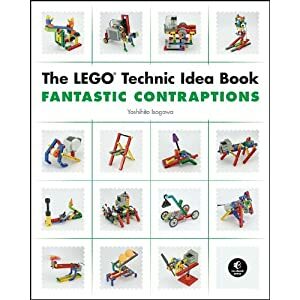 All in all though, these are excellent books showing a lot of great ideas for LEGO mechanisms. Even if you’re an experienced builder, there are surely some ideas in here you’ve never seen. Full Disclosure: The publisher sent me a free review book and sample galley, and the product links in this post are Amazon affiliate links. Besides Amazon, you can get the books from No Starch Press directly or through their distributor O’Reilly. I just stumbled across a way to build a 7-way radial symmetry in LEGO. A technique for building 7-way radial symmetry in LEGO. The blue 2×2 plates are connected to each other using plate hinges in a ring, and when I built that I noticed the ring looked like the right diameter to go around a 4×4 round piece. The hinges actually protrude a little into the center, but by sandwiching the two 4×4 rounds together and filling the space inside with a round 2×2 plate and seven (leaving one stud open) 1×1 round plates, you can make it all fit nicely. And since the 4×4 rounds and 2×2 round plate have axle holes, it can easily be connected to any Technic mechanism. If you stick an axle in the middle it twirls like a top – it’s very well balanced. How best to share building instructions for my creations? Every once in a while I get a request to share building instructions for my models. I am willing to do so, but haven’t quite figured out the best way. I was wondering if people might want to comment and make some suggestions? The ugly side of the equation comes when I contemplate compensation. Do I sell them or just give them away? I think it depends on how much work I have to put into them. I won’t go through the trouble of creating printed instructions for free, but I might be willing to share the LDraw files for free (Creative Commons licensed). The question is, how much would people be willing to pay, and is that enough to justify the work it would take me to prepare nice looking instructions?